Hikers are aware that temperatures in the mountains can change quickly and without warning. Because of that, maybe the most important piece of gear you can bring backpacking is a lightweight, warm jacket. Even in August, I pack my down jacket for camping, just in case. 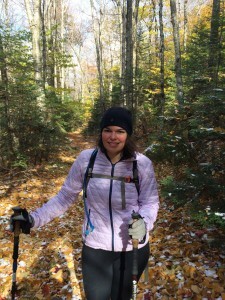 I tried out the Mountain Hardwear Micro Thermostatic jacket. 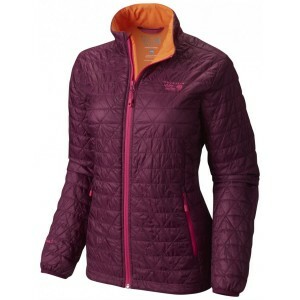 Although I usually use down because of how compressible and light it is, the thermostatic is made of an ultra light synthetic material (literally described as ‘synthetic down’) and boasts a lighter weight than my current down jacket – plus it still retains its heat when wet, something that down jackets are not so good for. The Micro Thermostatic is the perfect balance for crisp fall day hikes hovering in the 40s. Circumstance of review: I used this jacket for late summer / early fall hiking in the White Mountains, usually in temperatures between 30 and 60 degrees Fahrenheit. It was a great layer for above 40 degrees, but unfortunately not quite warm enough to be a camp jacket at night. 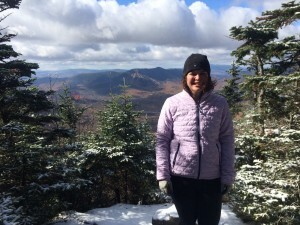 Even with the jacket layered over two shirts, I found myself shivering in temperatures in the high 30s once my body cooled down – something that hasn’t been a problem for me with my old down jacket at that temperature. This jacket offers more warmth than my base layer wool shirt, but less than I am comfortable with. It was, however, great for chilly ridgelines where I wanted to make good time. It kept me warm without causing me to sweat, and cut the wind well – something that would usually require a three-layer system for me with a wool shirt and rain jacket over my base. Note: I did not rock climb in this jacket because I was testing it as a hiker, but plan on doing so in the future – it seems like it would offer the perfect amount of warmth for climbing in the fall. Fit: The cut of this jacket is definitely more flattering than most insulated jackets and it is comfortably fitted. I usually wear a medium in outdoor gear (my upper measurements are 30 / 38) and their medium fit me just right. Style: I’m going to digress a little here… The diamond pattern looks great, but unfortunately Mountain Hardwear undoes their self-described effort to be ‘fashion-forward’ (this description is noticeably absent from the men’s Thermostatic…) by offering most of their women’s line in pretty hideous colors. 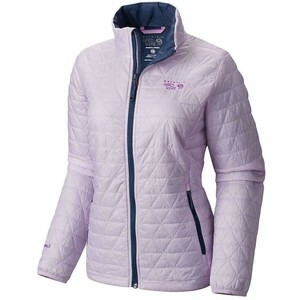 Their usual options are light purple, hot pink, regular purple, teal (which somehow has a purplish hue), dark purple, black, grey, or white (the last three being less than ideal for winter and night hiking). There’s nothing wrong with purple, but it isn’t universal to women – and there are even some women who don’t like it. Mountain Hardwear makes fantastic lightweight gear that is up to speed with the year 2015 on every aspect except color, which is inexplicably still gendered – so I really hope they start offering a women’s line that’s equivalent to the men’s line. Women also want to be visible in the dark and the snow without looking like 50 shades of eggplant. 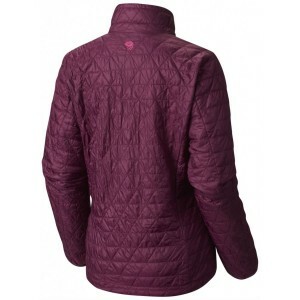 Storage/Durability: This jacket is extremely storable and compresses very well for a synthetic jacket. True to its specs, it is lightweight and easy to throw in your bag for a hike. The durability, however, is not great. I noticed the stitches on the sleeves snagging and pulling the very first time I hiked with it, and snags have appeared in other places since then. The material itself has not torn yet, nor has there been any loss of the synthetic insulation, so this might just be an aesthetic issue. Waterproofness/Windproofness: I experienced a little light rain and a lot of wind with no problem. I can’t speak for its ability in a downpour, but I can say that it does a fantastic job keeping wind out. The elastic on the cuffs and bottom of the jacket cinch at the right junctions to keep you warm and toasty even in those big gusts of wind you get on a ridge. Looking stylish on Middle Tripyramid. Pros: This jacket is great for a specific purpose: shoulder season day hikes. It’s easy to take off and put on for a quick break at the top, even on a chilly summer day, and I don’t become a sweaty mess two minutes into hiking with it when I start moving again. It is a perfect layer to fit over my base layers and under my backpack, it takes up virtually no room in my pack, and, at under 10 ounces, it’s easy on the knees. Cons: The stitching seems a bit delicate so far, which could cause eventual tears in the material down the line. Other than that, my only major concern is that it isn’t warm enough for camping or winter day hikes where I live. Value: Planning for a thru-hike, I have to say that I would not pay $175 dollars for this item. Realistically, this jacket is about as warm as a big sweatshirt. The big differences are that it is more wind proof and it is much lighter. Given this, and the stitching on the sleeves, I would say it is great for day hikes in the summer or shoulder seasons – as well as rock climbing in the fall – but not the best choice for a long backpacking trip, since it isn’t quite warm enough to justify taking. If I’m going to spend big money on something for its weight savings, it’s an item that I plan to take backpacking and not on a day-hike. 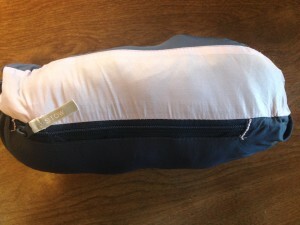 Purchasing the Micro Thermostatic for backpacking is similar to getting a summer sleeping bag. It’s not a necessary item, but it is a weight-saving item for a specific purpose. You could ship yourself this on a thru-hike and easily save several ounces compared to your warmer fall/spring jacket – but then again, you could also just buy the MH Ghost Whisperer for the same price as those two jackets and have the best of both worlds. The Micro Thermostatic zipped into its own pocket. Rock climbing or day-hiking in the shoulder season? Consider the Micro Thermostatic or its cousin, the regular Thermostatic (on sale on Backcountry). Backpacking or winter hiking? Check out the Ghost Whisperer instead.